IL-15 regulates central and effector memory CD8 T cell (TCM and TEM, respectively) homeostatic proliferation, maintenance, and longevity. Consequently, IL-15 availability hypothetically defines the carrying capacity for total memory CD8 T cells within the host. In conflict with this hypothesis, previous observations demonstrated that boosting generates preternaturally abundant TEM that increases the total quantity of memory CD8 T cells in mice. In this article, we provide a potential mechanistic explanation by reporting that boosted circulating TEM do not require IL-15 for maintenance. We also investigated tissue-resident memory CD8 T cells (TRM), which protect nonlymphoid tissues from reinfection. We observed up to a 50-fold increase in the total magnitude of TRM in mouse mucosal tissues after boosting, suggesting that the memory T cell capacity in tissues is flexible and that TRM may not be under the same homeostatic regulation as primary central memory CD8 T cells and TEM. Further analysis identified distinct TRM populations that depended on IL-15 for homeostatic proliferation and survival, depended on IL-15 for homeostatic proliferation but not for survival, or did not depend on IL-15 for either process. These observations on the numerical regulation of T cell memory indicate that there may be significant heterogeneity among distinct TRM populations and also argue against the common perception that developing vaccines that confer protection by establishing abundant TEM and TRM will necessarily erode immunity to previously encountered pathogens as the result of competition for IL-15. After clearance of an acute infection, expanded populations of pathogen-specific memory CD8 T cells are maintained and can be broadly divided into three distinct subsets, each with discrete trafficking properties and roles in immunosurveillance (1). Central memory CD8 T cells (TCM) are recirculating T cells that migrate between blood and lymph nodes (LN) by crossing high endothelial venules (HEV) and are typically poised to proliferate should they re-encounter Ag. Effector memory CD8 T cells (TEM) patrol blood and certain nonlymphoid tissues and constitutively express markers of effector differentiation, but lack the ability to cross HEV. Resident memory CD8 T cells (TRM) make up a third, more recently appreciated subset that does not leave and re-enter tissues (and thus does not cross HEV). TRM can be found in nonlymphoid tissues, certain vascular compartments, and secondary lymphoid organs (SLO), and they accelerate control of local infections (2, 3). Recent work highlighted the collaboration between resident and recirculating CD8 T cells in the event of reinfection; however, the factors that regulate the size of these populations and how subsequent unrelated infections alter T cell numbers are not completely understood. 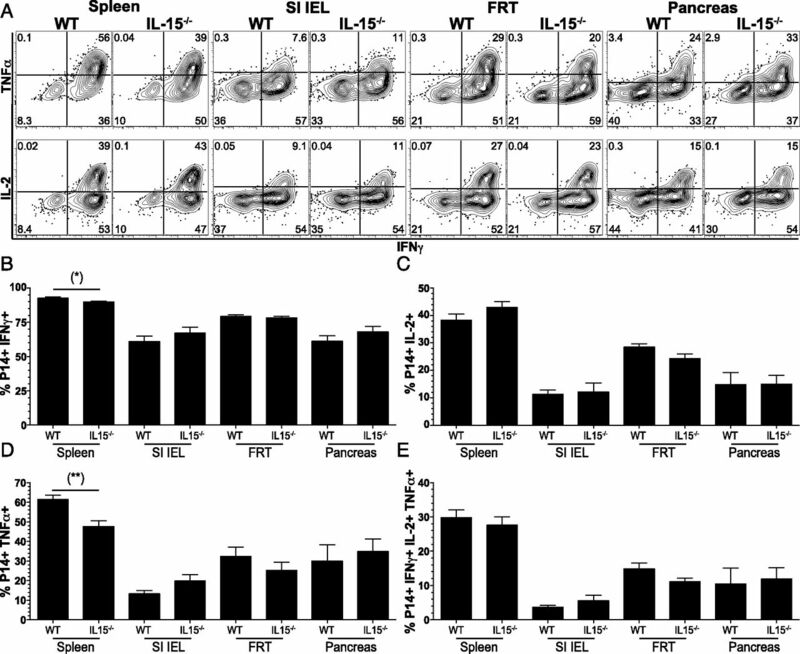 IL-15 is a common γ-chain cytokine that promotes homeostatic proliferation (HP) and survival of circulating TCM and TEM after primary infection (4–6). IL-15 is also required for the development and maintenance of CD103+ CD8 TRM in the skin epidermis following HSV infection (7). Consequently, one hypothesis is that IL-15 defines the host’s carrying capacity for memory CD8 T cells within lymphoid and nonlymphoid tissues, suggesting that subsequent infection may result in the displacement of pre-existing memory CD8 T cells (8), in part because of competition for IL-15 (9). However, it is unclear whether all memory CD8 T cells require IL-15, and IL-15–independent CD8 T cells were observed after local lung infection, by TRM in secondary lymphoid organs, and during persistent infection (10–13). Heterologous prime-boost-boost (HPBB) vaccination involves immunizing a host with three serologically distinct vectors that all carry the same conserved CD8 T cell epitope. Iterative T cell stimulation with potent HPBB vaccines can generate amplified populations of recirculating memory CD8 T cells that undergo less contraction with each subsequent boost (14). Most memory CD8 T cells generated by HPBB are TEM, as defined by their lack of CD62L expression (15, 16). However, TEM generated by HPBB are phenotypically distinct from TEM generated after a primary infection (17). Of note, we demonstrated previously that HPBB vaccination did not induce substantial attrition of pre-existing CD8+ TCM specific for other pathogens; thus, HPBB immunization substantially increased the overall magnitude of the memory CD8 T cell compartment (15). How HPBB is able to introduce a large new pool of TEM without causing coordinate erosion of pre-existing memory CD8 T cells is unknown. In this study, we evaluated the role of IL-15 in different contexts of memory T cell differentiation, including HPBB vaccination and a primary viral infection that establishes broadly distributed TRM. C57BL/6 mice were purchased from The Jackson Laboratory. All mice were used in accordance with National Institutes of Health and the University of Minnesota Institutional Animal Care and Use Committee guidelines. For experiments analyzing CD8 T cells generated by the HPBB system, N52–59-specific primary memory CD8 T cells were generated by i.v. infection of CD45.2+ naive C57BL/6 mice (age matched to tertiary C57BL/6 mice) with 1 × 107 PFU vesicular stomatitis virus Indiana strain (VSVind). For the generation of tertiary memory CD8 T cells, CD45.1/CD45.1+ 8–10-wk-old naive C57BL/6 mice were primed i.v. with 5 × 105 PFU vesicular stomatitis virus New Jersey strain, rested for 60–90 d, infected i.v. with 2 × 106 PFU recombinant vaccinia virus expressing the N protein of VSV (18), rested for an additional 60–90 d, and challenged i.v. with 1 × 107 PFU VSVind. For homeostatic maintenance experiments, 5 × 105 primary P14 or H-2Kb-N52–59–specific tertiary memory CD8 T cells were cotransferred into naive C57BL/6J or IL-15−/− recipients. The number of donor cells in spleen was quantified 60 d posttransfer. To measure HP, donor cells from primary P14 or H-2Kb-N52–59–specific tertiary memory CD8 T cells were labeled with CFSE or CellTrace Violet, according to the manufacturer’s protocol (Invitrogen). A total of 5 × 105 labeled cells was transferred into naive C57BL/6J or IL15−/− mice. Turnover was analyzed in spleen 60 d posttransfer. For the generation of memory P14 CD8 T cells, 5 × 104 naive Thy1.1 P14 CD8+ T cells were transferred i.v. into naive C57BL/6 or IL15−/− recipients. The following day, mice were infected i.p. with 2 × 105 PFU lymphocytic choriomeningitis virus (LCMV) Armstrong. For BrdU experiments, at 52 d postinfection, P14 memory wild-type (WT) or IL15−/− chimeras were given 0.8 mg/ml BrdU in a solution of 2% sucrose/drinking water for 8 d.
Lymphocytes were isolated from peripheral tissues, as previously described (19). Isolated lymphocytes were stimulated with LCMV gp33–41 peptide (1 μg/ml) for 4 h at 37°C, and cytokine secretion was evaluated as described earlier (20). Single-cell suspensions were stained with Abs against CD69 (H1.2F3), CD44 (IM7), Thy1.1 (OX-7), and CD62L (MEL-14) (all from BioLegend); CD8a (53-6.7), CD103 (M290), CD45.1 (A20), CD45.2 (104), IFN-γ (XMG1.2), TNF-α (MP6-XT22), and IL-2 (JES6-5H4) (all from eBioscience); and BrdU (B44) (BD Biosciences). Samples were acquired on a Fortessa flow cytometer (BD Biosciences). Immunofluorescence was performed as described (21). Abs against Thy1.1 (OX-7), CD45.1 (A20), and CD8β (YTS156.7.7) (all from BioLegend) were used to stain sections. For in situ tetramer staining, mouse female reproductive tracts (FRT) and salivary glands (SG) were manually cut into ∼500-μm sections using a surgical blade. Tissue pieces were incubated with PE-conjugated tetramers in 2% FBS in PBS overnight at 4°C. The following day, tissues were washed with ice-cold PBS three times on ice. Tissue pieces were fixed in 2% paraformaldehyde in PBS for 2 h, washed in PBS, and placed in a 30% sucrose PBS solution overnight. The following day, tissue pieces were frozen in OCT.
HPBB vaccination was shown to establish abundant TEM with minimal corresponding erosion in pre-existing TCM, leading to a net increase in total host memory CD8 T cells (15). How additional memory CD8 T cells are accommodated is unknown, which led us to investigate whether HPBB CD8 TEM are controlled by different homeostatic mechanisms compared with primary circulating memory CD8 T cells. We immunized CD45.1+ C57BL/6 mice on three occasions with serologically distinct viruses (vesicular stomatitis virus New Jersey strain, followed by recombinant vaccinia virus expressing the nucleoprotein from vesicular stomatitis virus and then VSVind, see Materials and Methods) that each stimulates an H-2Kb-N52–59–specific CD8+ T cell response (HPBB vaccination). Mice were rested for 60–90 d between immunizations; HPBB vaccination resulted in abundant CD45.1/CD45.1+ tertiary memory CD8 T cells specific for H-2Kb-N52–59 (14). We generated primary memory CD8 T cells by adoptively transferring naive Thy1.1+ P14 CD8 T cells that are specific for the glycoprotein of LCMV into naive C57BL/6 mice. Mice were infected with LCMV on the following day. Sixty-five days after primary LCMV or tertiary HPBB immunization, lymphocytes were isolated from the spleens of both mice, labeled with CFSE, and cotransferred into C57BL/6 recipients to monitor basal turnover within the same mice (Fig. 1A). Sixty days after transfer, splenocytes were isolated, and CFSE dilution was assessed on primary P14 and tertiary H-2Kb/N MHC I tetramer+ memory CD8 T cells by flow cytometry. As shown in Fig. 1B and 1C, tertiary memory CD8 T cells underwent fewer homeostatic divisions than primary CD8 T cells. Because CD62L− memory CD8 T cells undergo less HP than CD62L+ memory CD8 T cells, this may be explained by the enrichment of CD62L− cells in tertiary immune populations (Fig. 1D) (17, 22). Therefore, we segregated our analysis based on CD62L expression and found that, regardless of CD62L expression, tertiary memory CD8 T cells underwent less HP compared with their primary memory CD8 T cell counterparts (Fig. 1E, 1F). Thus, primary and tertiary memory CD8 T cells exhibited fundamental differences in their rate of HP that was not completely defined by CD62L expression. Tertiary memory CD8 T cells undergo less HP than primary memory CD8 T cells. (A) A total of 5 × 105 primary Thy1.1+ P14 or CD45.1+ H-2Kb-N52–59–specific tertiary memory CD8 T cells were labeled with CFSE and transferred into naive C57BL/6. Sixty days after transfer, CFSE dilution was evaluated by flow cytometry. Cumulative frequency graph (B) and representative graphs (C) showing CFSE dilution of primary P14 or H-2Kb-N52–59–specific tertiary memory CD8 T cells. (D) Expression of CD62L in primary P14 or H-2Kb-N52–59–specific tertiary memory CD8 T cells 60 d after transfer into naive C57BL/6 mice. Representative graphs (E) and cumulative frequency graphs (F) showing CFSE dilution in CD62L+ and CD62L− P14 or H-2Kb-N52–59–specific tertiary memory CD8 T cells. Data are from six mice from two independent experiments. *p < 0.05, **p < 0.01, ***p < 0.001. The common γ−chain cytokine IL-15 is required for HP and maintenance of primary memory CD8 T cells after acute infection (23). To determine whether IL-15 is required for maintaining tertiary memory CD8 T cells, we cotransferred Thy1.1+ primary and CD45.1+ tertiary memory CD8 T cells into CD45.2+ WT or IL-15−/− naive recipients. After 60 d, we enumerated Thy1.1+ P14 and H-2Kb/N52–59 MHC I tetramer+ CD8 T cells in the spleen. As shown in Fig. 2, recovery of primary and tertiary CD62L+ memory CD8 T cells was decreased 60 d after transfer into IL-15−/− mice compared with controls. In contrast, maintenance of tertiary CD62L− N52–59-specific CD8 T cells was not observably impaired in IL-15−/− mice. These data indicate that tertiary CD8 TEM are less stringently dependent on IL-15 for maintenance, which could explain how they exceed IL-15–defined carrying capacities that may dictate the size of CD8 TCM and primary CD8 TEM populations. Tertiary memory CD8 T cells do not require IL-15 for maintenance. A total of 5 × 105 primary Thy1.1+ P14 or tertiary CD45.1+/H-2Kb-N52–59 MHC I tetramer+ memory CD8 T cells were transferred into CD57BL/6 or IL-15−/− hosts. 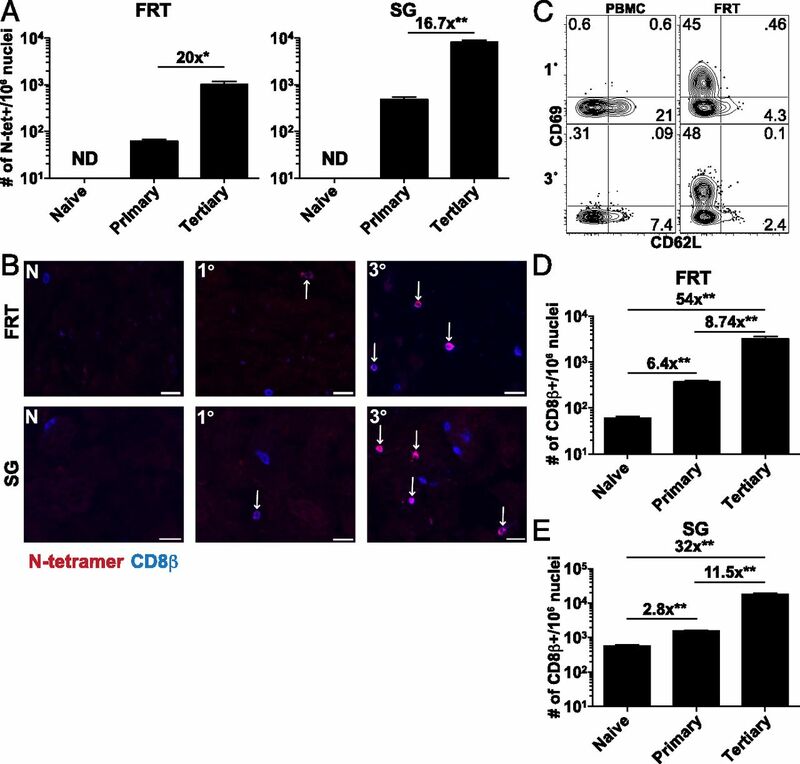 Sixty days after transfer, total P14 and H-2Kb-N52–59 MHC I tetramer+ CD8 T cell numbers were assessed in the spleen. Each graph consists of data from four mice/group representative of two or three independent experiments totaling 8–10 mice/group. *p < 0.001. The presence of memory CD8 T cells within barrier tissues accelerates protection against local infections (24–26). It is unknown whether the total number of memory CD8 T cells within mucosal tissues is homeostatically regulated and, thus, fixed at a defined overall carrying capacity or whether mucosal memory CD8 T cell quantity is flexible in size. This issue is particularly important given the impetus to design vaccines that attempt to establish abundant memory CD8 T cells at mucosal surfaces. To address whether the FRT and SG had a defined carrying capacity for memory CD8 T cells, we compared total CD8β+ lymphocytes, as well as N52–59-specific memory CD8 T cells, in the FRT and SG via in situ tetramer staining and immunofluorescence microscopy among naive, primary immune (VSVind only), and tertiary immune (HPBB, as above) mice. As shown in Fig. 3A and 3B, HPBB-vaccinated mice had ∼20-fold more N52–59-specific memory CD8 T cells in the FRT and SG compared with mice that received a single immunization. Primary and tertiary memory CD8 T cells in the FRT expressed CD69 and low levels of CD62L, suggesting that they may include resident populations (Fig. 3C). In addition, HPBB immunization precipitated an ∼30–50-fold increase in the total number of CD8β+ T cells within the FRT and SG compared with naive mice (Fig. 3D, 3E). These data suggested that HPBB immunization increased the magnitude of recirculating TEM in blood and spleen (15), as well as the magnitude of mucosal TRM. Moreover, we also found that a single immunization increased the total number of CD8β+ T cells in the FRT ∼6-fold compared with naive mice. This suggested that the numerical size of the CD8β+ TRM population within the mucosa was quite flexible and perhaps even primary memory CD8 T cells were not subject to the constraints of IL-15–mediated homeostatic regulation in this compartment. The number of memory CD8 T cells in the female reproductive mucosa and SG is not fixed. (A) Total numbers of H-2Kb-N52–59–specific primary and tertiary memory CD8 T cells in the FRT and SG were assessed by in situ tetramer staining and immunofluorescence microscopy 60 d after final immunization with VSVind. (B) Representative images of H-2/Kb-N52–59 MHC I tetramer (red) and CD8β (blue) staining. Tetramer+ CD8 T cells are indicated by arrows. Scale bars, 20 μm. (C) Flow cytometric analysis of CD62L and CD69 expression on H-2Kb-N52–59–specific primary and tertiary memory CD8 T cells in peripheral blood and FRT 60 d after final immunization. Total numbers of CD8β+ T cells in the FRT (D) and SG (E) were quantified by immunofluorescence microscopy in naive, primary, and tertiary memory mice. Each graph consists of data from three mice/group representative of two independent experiments totaling six mice/group. *p < 0.01, **p < 0.001. We next tested whether primary CD8 TRM that became established within mucosal tissues could persist in the absence of IL-15. To this end, we used a model system in which resident memory populations were characterized extensively via parabiosis (19). Naive Thy1.1+ P14 CD8 T cells were transferred into naive C57BL/6 WT or IL-15−/− mice. The following day, mice were infected with LCMV Armstrong, and P14 CD8 T cells were enumerated at the peak of the effector response (day 7) and at a memory time point (day 60). Seven days postinfection, there was no significant difference in the number of P14 CD8 T cells between WT and IL-15−/− mice in any tissue examined (Fig. 4A), suggesting that IL-15 is not necessary for the generation of effector CD8 T cells or their migration to nonlymphoid tissues after LCMV infection. Consistent with the dependence of recirculating primary memory CD8 T cell populations on IL-15 for maintenance, we found a substantial reduction in memory CD8 T cells within LN and spleen at 60 d postinfection (Fig. 4B). However, in several tissues that are populated almost exclusively by TRM, including the FRT and the small intestine (SI), we did not observe a reduction in memory CD8 T cells in the absence of IL-15 or a significant change in the expression of CD103 (Supplemental Fig. 1). Nevertheless, IL-15 dependence varied demonstrably among TRM populations within different nonlymphoid tissues. Indeed, TRM in the SG and kidney were almost completely lost in IL-15−/− mice. These data reveal the existence of CD8 TRM that are homeostatically maintained independently of IL-15, but they also highlight potential heterogeneity among TRM that inhabit different tissues. IL-15 is not required for TRM survival in all tissues. A total of 5 × 104 Thy1.1 P14 transgenic T cells was transferred into C57BL/6 or IL15−/− mice and infected with 2 × 105 PFU LCMV Armstrong. P14 CD8 T cell numbers were assessed by flow cytometry on day 7 (A) or day 60 (B) postinfection. Each graph consists of data from five to nine mice/group representative of three independent experiments for a total of 10–12 mice/group. *p < 0.05, **p < 0.01, ***p < 0.001. The long-term maintenance of the circulating memory CD8 T cell pool is intrinsically tied to IL-15–driven homeostatic self-renewal. Therefore, we posited that IL-15 dependence in nonlymphoid tissue would dictate whether CD8 TRM underwent HP in different tissues. To test this hypothesis, we treated WT and IL-15−/− P14 LCMV immune chimeras with BrdU in the drinking water for 8 d and then examined BrdU incorporation to measure CD8 T cell turnover. As shown in Fig. 5, ∼15% of circulating memory CD8 T cells in spleen or LN of WT mice incorporated BrdU after 8 d, whereas its incorporation by circulating memory CD8 T cells was dramatically reduced in IL-15−/− mice. Additionally, SLO TRM, a minority population that can be identified on the basis of CD69 expression in the LCMV infection model (11), also underwent less HP in IL-15−/− hosts compared with WT hosts. Interestingly, the CD69+ resident population became enriched relative to their recirculating CD69− counterparts in SLO, suggesting that SLO TRM were dependent on IL-15 for HP but not for survival. CD8 TRM in the thymus exhibited a similar decrease in BrdU incorporation in IL-15−/− mice without a decrease in overall numbers (Fig. 4B). These data demonstrate that SLO and thymus TRM persistence does not require HP. IL-15–dependent and -independent HP reveals distinct TRM subsets. (A) Fifty-two days after LCMV infection, BrdU was put in the drinking water. After 8 d, BrdU incorporation in memory P14 CD8 T cells was assessed in the indicated tissues. (B) Cumulative frequency of BrdU+ P14 CD8 T cells. Each graph consists of data from five to nine mice/group representative of three independent experiments for a total of 10–12 mice/group. **p < 0.01, ***p < 0.001. Unlike CD8 TRM in SLO and thymus, CD69+ CD8 TRM in the SG and kidney were dependent on IL-15 for survival and HP. This suggests that TRM are composed of distinct subsets with heterogeneous requirements for IL-15 and HP. In support of this interpretation, TRM in the FRT, SI, and pancreas underwent significant levels of HP, even though these TRM populations were maintained in the absence of IL-15. Moreover, FRT, SI, and pancreas TRM incorporated equivalent BrdU in IL-15−/− mice, demonstrating IL-15–independent HP. In summary, these data reveal the existence of TRM that divide and depend on IL-15 for survival, that divide in an IL-15–dependent manner but do not depend on IL-15 for survival, and that divide and survive independently of IL-15. Thus, TRM are a heterogeneous population composed of distinct subsets with unique maintenance requirements and patterns of self-renewal. CD8 T cell–derived cytokines are important mediators of host protection, and the ability of CD8 T cells to secrete cytokines is often used as a metric for assessing T cell quality (27). Previous work demonstrated the ability of IL-15 to promote CD8 T cell secretion of cytokines (28–30); thus, we next tested whether IL-15 deficiency would have deleterious effects on CD8 TRM function. P14 immune chimeras were established in WT and IL-15−/− mice (as in Fig. 4). Thirty days after LCMV infection, TRM were isolated from the SI epithelium, the pancreas, and the FRT, and circulating memory CD8 T cells were recovered from spleen. Isolated memory CD8 T cells were restimulated in vitro with gp33–41 peptide for 4 h, and secretion of IFN-γ, IL-2, and TNF-α was assessed by flow cytometry. We specifically assessed these three cytokines because they were shown to mediate a previously reported TRM sensing and alarm function (31, 32). In all tissues examined, we found that TRM were able to secrete all three cytokines independently of IL-15 (Fig. 6). Further, circulating memory CD8 T cells isolated from the spleens of IL-15−/− mice exhibited only a minor defect in the capacity to secrete IFN-γ and TNF-α, which is consistent with previous observations (33). Thus, we failed to detect a role for IL-15 in regulating CD8 TRM cytokine polyfunctionality. IL-15 is dispensable for memory CD8 T cell cytokine secretion after in vitro Ag stimulation. P14 immune chimeras were generated in WT and IL-15−/− mice, as described in Fig. 4. Thirty days postinfection, P14 CD8 T cells were isolated from the spleen, SI intraepithelial lymphocytes, FRT, and pancreas and were stimulated in vitro with gp33-41 peptide for 4 h. (A) Representative FACS plots of IFN-γ, IL-2, and TNF-α staining on P14 CD8 T cells after peptide stimulation. Frequency of P14 CD8 T cells that stained positive for IFN-γ (B), IL-2 (C), or TNF-α (D) or that stained positive for all three cytokines (E). Each graph consists of data from five mice/group representative of two independent experiments totaling eight mice/group. *p < 0.05, **p < 0.01. It was proposed that the abundance of memory CD8 T cells positioned within barrier tissues could be a critical determinant of host protection (34). One deterrent against developing vaccines based on this objective is the concern that each newly introduced TRM would displace a TRM specific for previously encountered infections. In other words, vaccination could compromise host immunity against commonly encountered pathogens. This remains an important consideration that demands further exploration, but our data may provide some perspective on this hypothesis. The introduction of new TRM simply resulted in more CD8 T cells within the FRT, and the total number of CD8 T cells varied over a 50-fold range depending on the infectious experience. A previous report demonstrated that, like TCM and TEM, TRM were IL-15 dependent (7). However, this analysis was based solely on CD103+ TRM in the skin epidermis. Our data revealed that TRM within different anatomic compartments varied considerably in their IL-15 dependence. Teleologically, regulating FRT TRM via IL-15 may have the unwanted consequence of inducing lymphopenic-driven expansion of TRM in primary infected hosts. This may not be problematic in the skin because TRM precursors compete with a pre-established visibly saturating population of dendritic epidermal T cells that densely colonizes the skin during development (35). In summary, these data support the hypothesis that distinct tissues regulate different populations of TRM, which may point to the existence of distinct TRM subsets. Moreover, the total number of TRM in nonlymphoid tissues may not be stringently regulated because they varied over a ≥50-fold range, although further studies will be needed to test whether an upper limit is achievable under physiological conditions. Observations of a dynamic range of total memory CD8 T cells are not limited to TRM. HPBB vaccination results in increased numbers of total memory CD8 T cells within the host, which are largely contained within the TEM pool. Many natural iterative stimulation events, either through heterosubtypic infections or persistent infections, may also lead to uncommonly large CD8+ TEM populations. Thus, it may be disadvantageous for the host to evacuate its pre-existing memory CD8 T cells to accommodate expanded TEM populations. Consistent with this conjecture, natural infection of humans with EBV, which causes a persistent viral infection resulting in robust CD8 T cell responses and increased CD45RA+ TEM (TEMRA), did not induce a measureable reduction in pre-existing CD8 T cells specific for CMV or influenza virus (36). In this study, we demonstrate that, unlike TCM and primary TEM, tertiary TEM were maintained after transfer to IL-15−/− hosts. This provides a potential mechanistic explanation by which the iteratively stimulated TEM population may result in increases in net memory CD8 T cells, as well as highlights heterogeneity in the regulation of circulating memory CD8 T cell subsets. Of course, these data do not exclude an important role for IL-15 in the generation of boosted memory CD8 T cells (33), nor observations that certain infections induce attrition of pre-existing memory CD8 T cells via acute induction of type I IFN, LN fibrosis, or other means (8, 37). We thank other members of the Masopust and Vezys laboratories for helpful discussions. This work was supported by National Institutes of Health Grants 2R01AI084913 and R01AI111671 (to D.M.) and T32AI007313 and F30DK100159 (to J.M.S.). K.E.P. was the recipient of a Robertson Foundation/Cancer Research Institute Irvington Fellowship. 2015. Tissue-resident memory T cells and fixed immune surveillance in nonlymphoid organs. J. Immunol. 195: 17–22.
. 2002. Cutting edge: requirement for IL-15 in the generation of primary and memory antigen-specific CD8 T cells. J. Immunol. 168: 4827–4831.
. 2002. 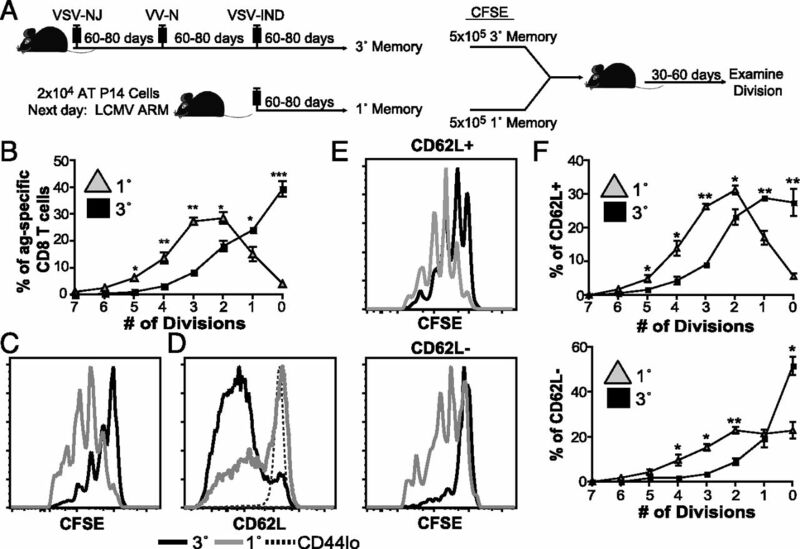 Interleukin 15 is required for proliferative renewal of virus-specific memory CD8 T cells. J. Exp. Med. 195: 1541–1548.
. 2002. Cytokine requirements for acute and basal homeostatic proliferation of naive and memory CD8+ T cells. J. Exp. Med. 195: 1515–1522.
. 1999. Attrition of T cell memory: selective loss of LCMV epitope-specific memory CD8 T cells following infections with heterologous viruses. Immunity 11: 733–742.
. 2006. Diverse functions of IL-2, IL-15, and IL-7 in lymphoid homeostasis. Annu. Rev. Immunol. 24: 657–679.
. 2007. Viral antigen and extensive division maintain virus-specific CD8 T cells during chronic infection. J. Exp. Med. 204: 941–949.
. 2014. Cutting edge: resident memory CD8 T cells occupy frontline niches in secondary lymphoid organs. J. Immunol. 192: 2961–2964.
. 2004. IL-15-independent proliferative renewal of memory CD8+ T cells in latent gammaherpesvirus infection. J. Immunol. 173: 2705–2714.
. 2011. Cutting edge: IL-15-independent maintenance of mucosally generated memory CD8 T cells. J. Immunol. 186: 6667–6671.
. 2013. Preexisting high frequencies of memory CD8+ T cells favor rapid memory differentiation and preservation of proliferative potential upon boosting. Immunity 39: 171–183.
. 2009. Memory CD8 T-cell compartment grows in size with immunological experience. Nature 457: 196–199.
. 2010. Repetitive antigen stimulation induces stepwise transcriptome diversification but preserves a core signature of memory CD8(+) T cell differentiation. Immunity 33: 128–140.
. 2006. Stimulation history dictates memory CD8 T cell phenotype: implications for prime-boost vaccination. J. Immunol. 177: 831–839.
. 1986. Recognition of cloned vesicular stomatitis virus internal and external gene products by cytotoxic T lymphocytes. J. Exp. Med. 163: 1529–1538.
. 2015. Lymphocytic choriomeningitis virus persistence promotes effector-like memory differentiation and enhances mucosal T cell distribution. J. Leukoc. Biol. 97: 217–225.
. 2013. Sensing and alarm function of resident memory CD8⁺ T cells. Nat. Immunol. 14: 509–513.
. 2006. Secondary memory CD8+ T cells are more protective but slower to acquire a central-memory phenotype. J. Exp. Med. 203: 919–932.
. 2012. A vaccine strategy that protects against genital herpes by establishing local memory T cells. Nature 491: 463–467.
. 2012. Skin infection generates non-migratory memory CD8+ T(RM) cells providing global skin immunity. Nature 483: 227–231.
. 2012. Regulation of innate CD8+ T-cell activation mediated by cytokines. Proc. Natl. Acad. Sci. USA 109: 9971–9976.
. 2002. IL-15 mimics T cell receptor crosslinking in the induction of cellular proliferation, gene expression, and cytotoxicity in CD8+ memory T cells. Proc. Natl. Acad. Sci. USA 99: 6192–6197.
. 2003. IL-21 in synergy with IL-15 or IL-18 enhances IFN-γ production in human NK and T cells. J. Immunol. 170: 5464–5469.
. 2014. T cell memory. Resident memory CD8 T cells trigger protective innate and adaptive immune responses. Science 346: 98–101.
. 2014. T cell memory. Skin-resident memory CD8⁺ T cells trigger a state of tissue-wide pathogen alert. Science 346: 101–105.
. 2010. IL-15 regulates both quantitative and qualitative features of the memory CD8 T cell pool. J. Immunol. 184: 35–44.
. 2012. Hidden memories: frontline memory T cells and early pathogen interception. J. Immunol. 188: 5811–5817.
. 2012. Primary Epstein-Barr virus infection does not erode preexisting CD8⁺ T cell memory in humans. J. Exp. Med. 209: 471–478.
. 2001. Attrition of bystander CD8 T cells during virus-induced T-cell and interferon responses. J. Virol. 75: 5965–5976.